Being the president is no easy job. Does your fifth grader know what it takes to be the president of the United States of America? Give him the mantle for the day and find out! 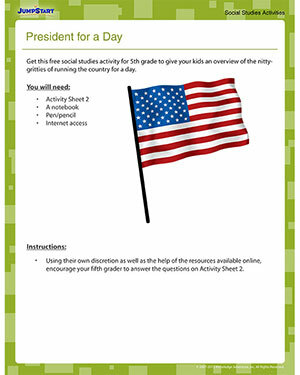 JumpStart's 'President for a Day' is a one-of-a-kind social studies activity for kids that encourages them to put themselves in the shoes of the president and think about the affairs of the country seriously. You cannot miss this!